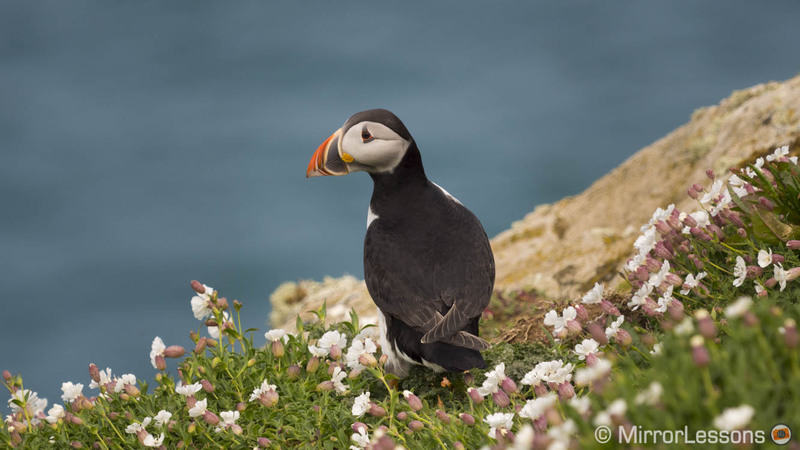 Last week, Mathieu and I ticked off a big item on our bucket list: seeing and photographing the puffins on Skomer Island in South Wales. 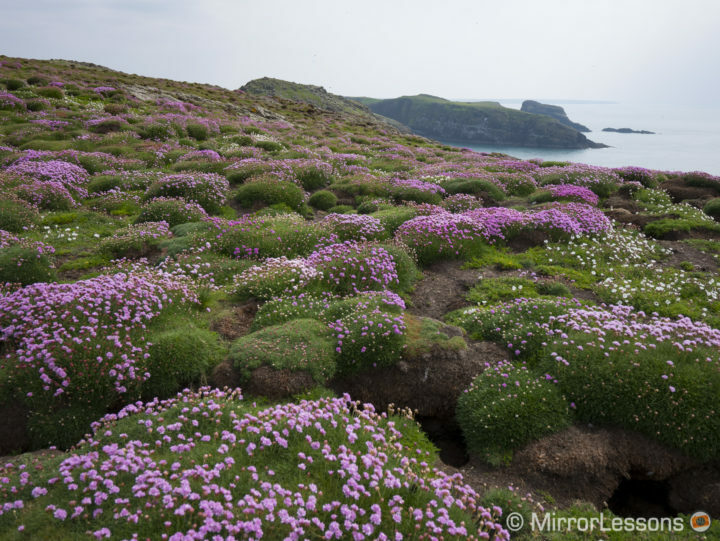 Every year between April and August, these beloved birds flock in the thousands to the island to breed, only to return to the sea for the rest of the year once their chicks have fledged. 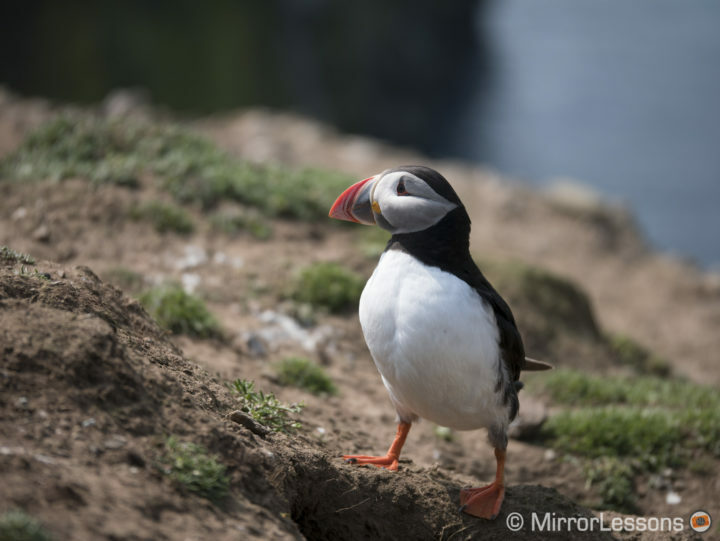 Puffins are extremely popular amongst wildlife photographers due to their distinctively-coloured beaks that give them a clown-like appearance – hence the nickname “clowns of the sea”. Since they have little fear of humans, you can get extremely close to them as they scuttle to and from their burrows, carrying dead grass to furnish the nesting chamber or sandeels to their growing chicks. This behaviour stands in stark contrast with that of most other birds and animals on the island, which prefer to remain elusive. 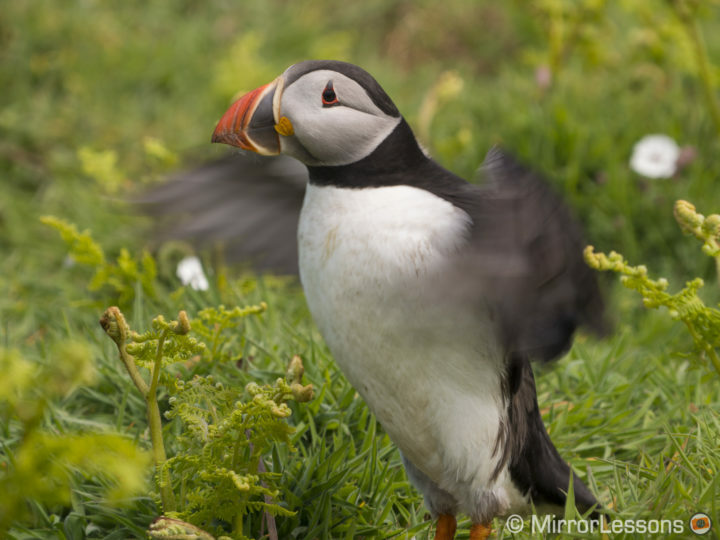 Despite their comical appearance, puffins are extremely hard-working, flying hundreds of kilometres per day to collect food for their chicks. 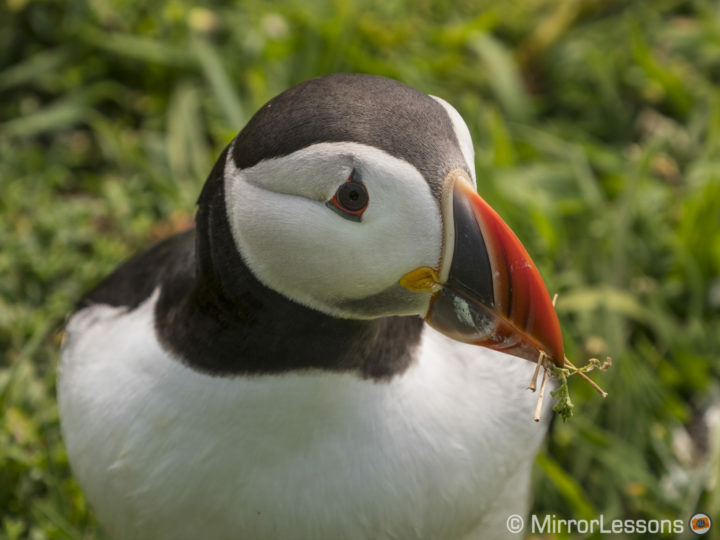 Some of the most iconic photographs of puffins show them carrying large quantities of fish in their beaks, and according to Welsh Wildlife, the world record is an astounding 80 small larval fish! 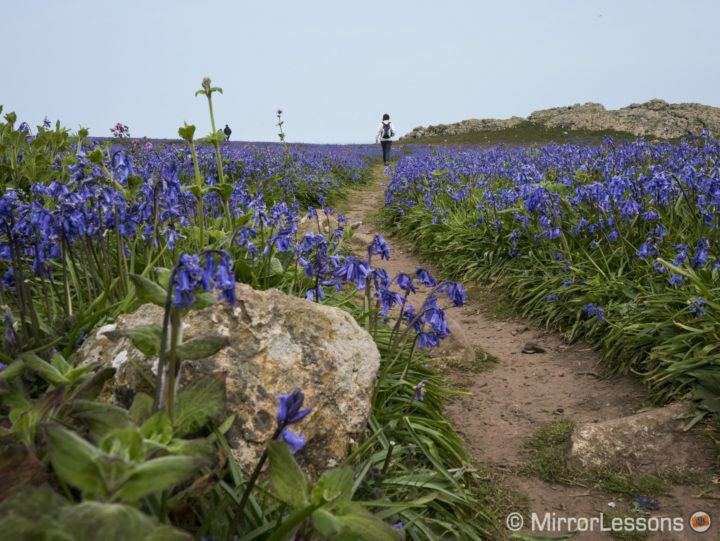 We happened to visit in early May, which isn’t the right time to observe the puffins carrying food unfortunately, but still provided ample opportunities to photograph the birds against a backdrop of bluebells and sea campion. The most densely populated area is The Wick, and this is where we (as well most other visitors) spent the majority of our time after completing the 4 mile trek around the island. 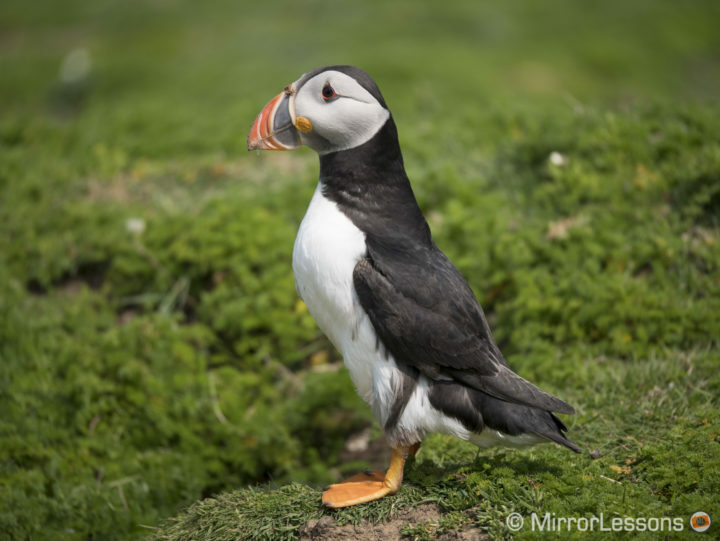 Since Mathieu had the Panasonic Lumix GH5 and the Leica 100-400mm f/4-6.3, he was able to capture a variety of images, from static pictures of the puffins shuffling around their burrows to action shots of them hurtling through the air at nearly 90km/h, wings flapping 400 times per minute. 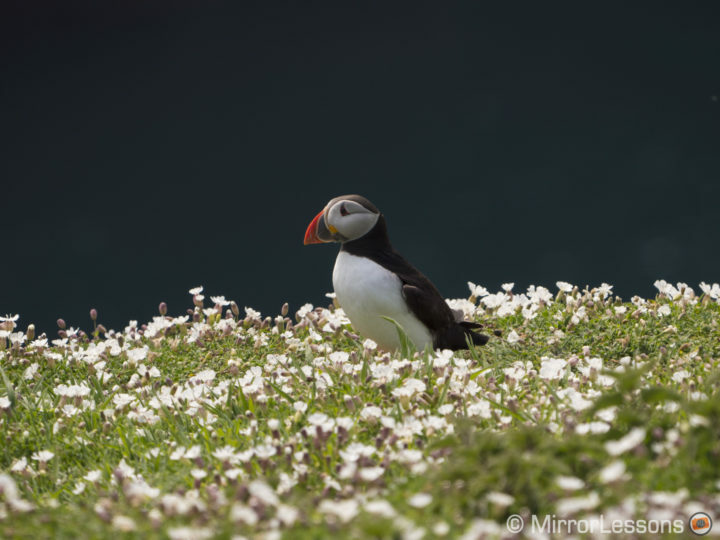 Having only brought the Lumix GX80 with the Pana-Leica 8-18mm for landscapes and the Lumix G 35-100mm f/2.8 for wildlife, I wasn’t able to capture any puffins in flight but the telephoto lens was more than enough to photograph those which had burrowed close to the path. I didn’t stay in one place for too long, however, as people standing along the path can block their access to the sea, making them more vulnerable to predatory gulls. In 2015, puffins were added to the International Union for Conservation of Nature (IUCN) Red List of Threatened Species. This means that these wonderful birds are now at risk of extinction due to pollution, declining food sources and oceanic shifts caused by climate change. 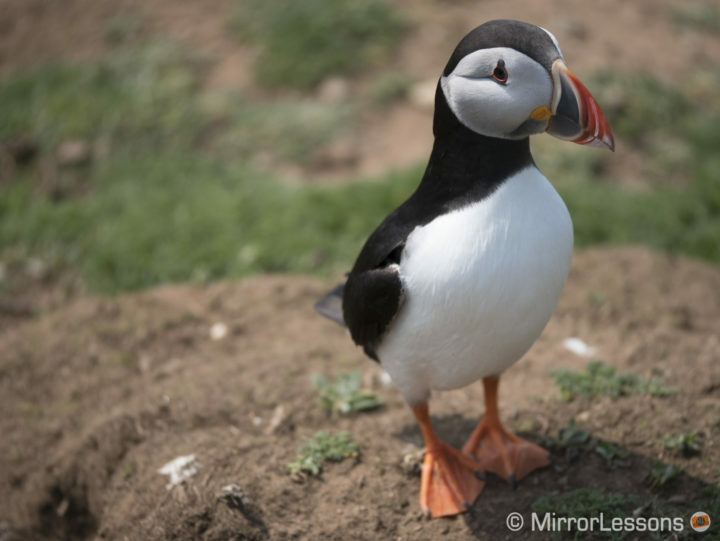 According to the RSPB, up to eight million puffins could be lost over the next 50 years, which accounts for two-thirds of the European population. 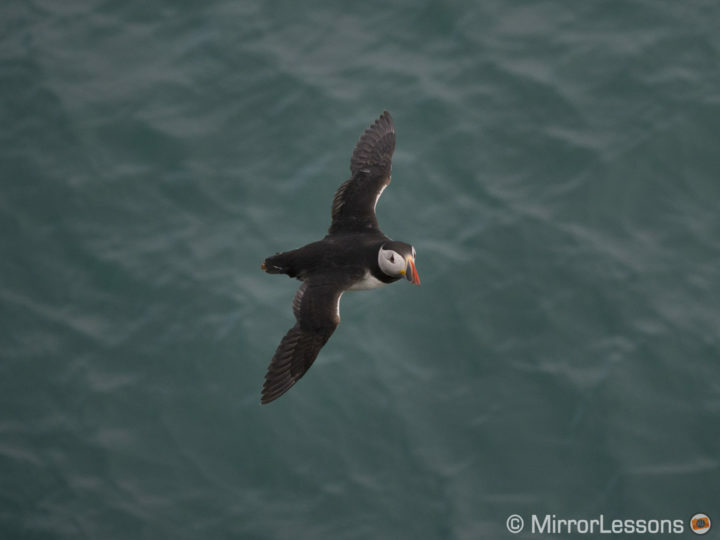 If you too would like to help puffins and other seabirds affected by pollution, commercial fishing and climate change here in the UK, here are just a few ways to do so. 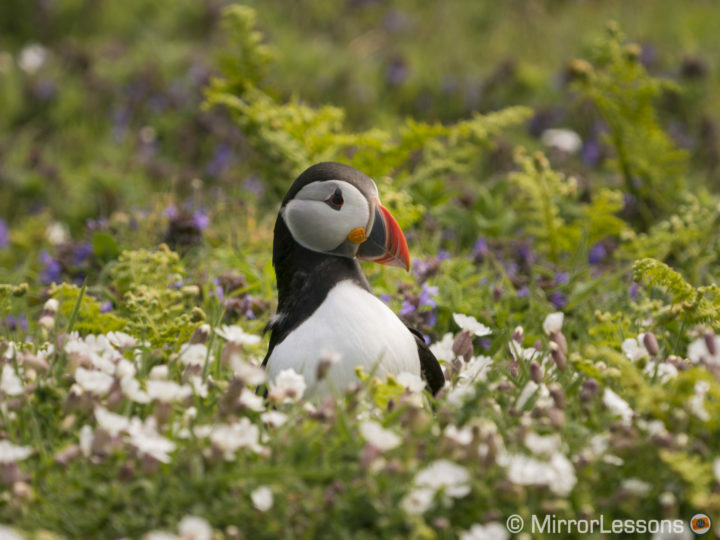 Have you ever had the chance to photograph a puffin? If so, we’d love to see your favourite picture below and hear about your experience.